My friends over at Comeback Kid are throwing the hottest party at this year's LMFF and you have the chance to win a double pass! Fashion Racquet is to be held at the ever awesome Penthouse Mouse pop up LMFF exhibition/party space that just gets better with every new location every year, its sure to be an amazing night. 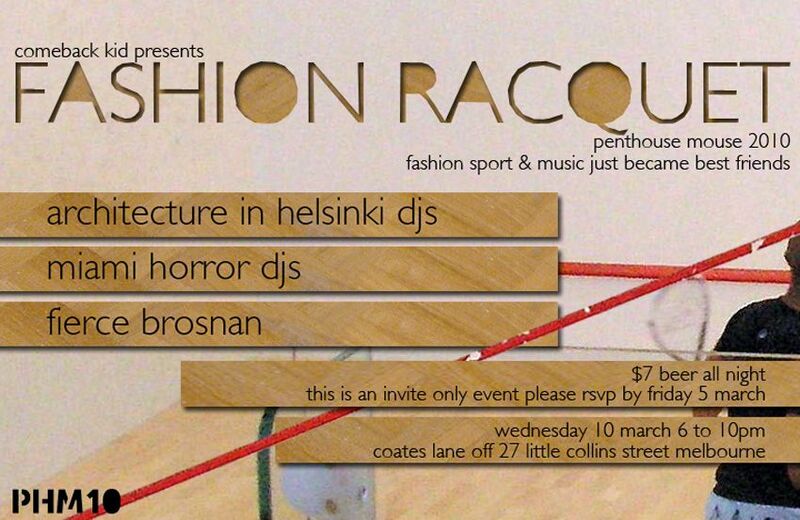 Especially with Miami Horror and Architecture in Helsinki dj'ing. Can't wait! To win the double pass all you have to do is comment on this post and the winner will be randomly chosen. The comp is open to those who will be in Melbourne on Wednesday 10th of March and the comp closes at 5pm Tuesday 9th of March. Maddison is the winner, using random.org which chose entry number 34 out of 40. Sounds fun. Looking forward to LMFF! Amazing Comp, AIH & Miami Horror will bring the good times!! Loves it! Pick me Pick me! loving the giveaways Hayley, Go us Melbourne Girls!!! wowza who doesnt love miami horror! want to see more of your avant garde outfits! Are you too busy eating that you don't have time to realise how superfluous all content of your blog/your stomach is? Amazing. Definitely looking forward to your LMFF outfits. your recent post about your achievements/moods/ when things go right.. agree. anxiety gets the better of me when i feel i must do better than before.and depression takes over telling me i cant. (even though everyone tells me how amazing/good/perfect the job was) but hey.. u know what..its probably a sign on being a perfectionist, which i do believe means very grounded/strong willed and sure of who you are as a person. you hayley, are an awesome inspiration for many girls wanting to get into styling/fashion. 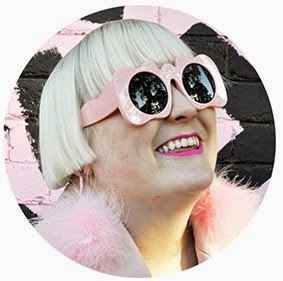 I've only just discovered your blog, and I have to say it's both inspiring and comforting to get hit by your truth bombs on the industry, your own fears and troubles and wearing couture when you're not exactly a sample size. Thank you so muich - I'll be coming back regularly!